Our new Halloween Collection- Glittery Gold Spooktacular party printables is now available in our shop! It is filled with ghastly ghouls and shimmering sparkles. With the color gold beings so hot right now I just knew I had to incorporate it into our new collection to give Halloween a little sophisticated glitz! I used Folk Art Metallic craft paint and it turned out PERFCT! It truly is metallic and gives off the coolest gold effect. I then added gold glitter to the large poster on the bat & pumpkin. To drink we had orange soda in cute glass bottles. 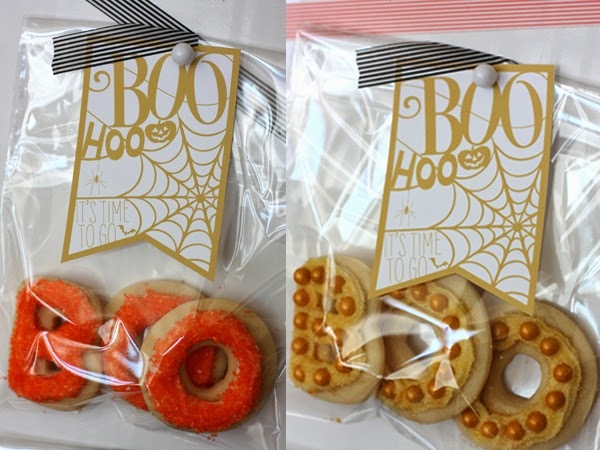 A tray filled with all different kinds of cookies to snack on at the party and to take home in our favor boxes and bags. 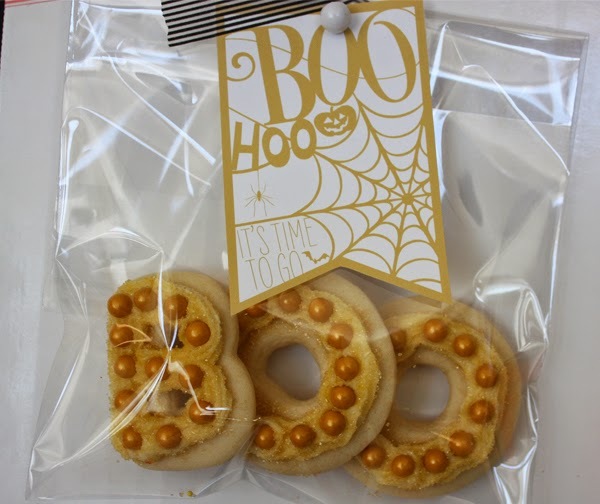 We make sugar cookies in Boo, Eek & RIP, Cookie Butter cookies (recipe coming soon….. and these are DELICIOUS!!!) and chocolate covered Oreos. Paper cones were filled with Halloween candy: Reeces, Twix, Kit Kats, Caramel Apple Milkyways, Snickers…. to name a few and then topped with a ghost peep. Our thank you tags were attached to sugar cookie saying that coordinated with the 2 different thank you tag sayings. Boo Hoo- it’s time to go and RIP- Remember the ghoul times. these thank you tags are my favorite printable item in our collection! they just crack me up! There are 4 additional signs that are included in our Gold Spooktacular Halloween printable collection and here is one of them. It’s pinned to a frame made entirely out of cork board- coming soon to our shop! You can paint the cork board or bling it out! « Summer in Parties…. See what we have been up to! Great party ideas dear, and idea of different types of cookies is also great for kid’s party but I am looking best penthouse nyc for arranging party for my younger daughter who is coming from Australia in next week with his husband. Any idea how I can find?